Novelty Shaver for Bald Head, 5 Flex Rotate Shaver with a stronger Motor that provides up to 22000 RPM for a fast and close shave of large areas of the head and body. Please note that this shaver is for short hair, so that if your hair is longer than 5mm/0.2inch, you will want to trim it down before using it with a head razor or regular pair of clippers so it’s easier to use. I really had high hopes for this razor but it keeps becoming not available. Please read my review on the Norelco 9700 instead which is the same style of electric razor to shave your head. This cordless ad plug-in shaver has a built-in, rechargeable battery that provides up to 50 minutes of continuous use on 5 hours of charging. You can also plug it in directly to 110 worldwide voltage AC and use it as a corded shaver! For safety reasons, please unplug the AC adapter when the item is not charging or shaving. Fully charge for 5 hours and enjoy a long shave time with this model. Patented Intelligent Micro Power Chip ensures that even when the battery is low, the shaver will maintain high RPM for the closest shave. Experience no nicks, cuts or burns, due to the 0.08MM Ultra-slim shaver foil and acute angle design that will not pull your hair or jam up during use. The Bald Head Shaver was designed specifically for short hair. You’ll enjoy the best benefits from trimming your hair to a length of about 3-5 days of natural growth before using this product. This product is so new on the market that unfortunately, we weren’t able to find any reviews out on it yet. Since we are unable to discuss what customers found beneficial or detrimental to the design of the Bald Head Shaver, we will compare this model with another popular product, the Bald Eagle Smart. The biggest difference that we can see right away between the two products is the length of the handle, with the Bald Head Shaver, TurnRaise offering a great improvement on handle size, shape and grip. The Bald Eagle Smart has more of a knob that the hand fits over for maneuverability, while the TurnRaise offers a great grip that looks as if the user would be able to keep a much better control over their shave. Since a longer handle means greater leverage, it’s easy to see just by the design of the TurnRaise that the user would be able to reach all of the areas that are out-of-sight. Another difference we take note of right away is the difference in the size of the motor, with the Bald Eagle shaver offering 10500 RPMs and the TurnRaise bringing 22000 RPMs to the table. That’s a huge difference in speed that the user is going to notice during their shave. Higher RPMs are going to result in a better, closer shave and a quicker experience from start to finish. While the Bald Eagle shaver fully charges quicker, and offers a longer shaving time (90 minutes), the TurnRaise experience is going to be well worth the extra time it takes to charge up its motor. Unless it takes you longer than 50 minutes to complete your shave, our guess is you’ll never miss the 90 minutes of shave time. Both shavers offer cordless and corded function, which may customers find quite appealing. The Bald Eagle offers a unique function that the TurnRaise does not, which is the ability to automatically contour to the curves of the head, however, we can’t really see that this is unique to the Bald Eagle. The fact that the TurnRaise does not have a bulky, knob-like handle in the way most likely means that the TurnRaise will be every bit as adaptable to curves as is the Bald Eagle. The TurnRaise offers Q-SUS noise cancellation. The reviews for the Bald Eagle are uncommonly high, showing how much its customers love the product. Although no reviews have yet come in for the TurnRaise, we suspect its reviews will be at least as high as for the Bald Eagle, and we will hazard a guess that they will be even higher, based on the design of the handle and its powerful motor. The unique design of the product offers a more user-friendly shaving experience than anything else out on the market today. 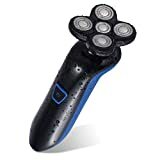 This is a shaver that can be used with or without a mirror, making it a great product to take on trips or bring along wherever you want a quick, close head or face shave. Corded and cordless function only offers more reason to love it. We predict the TurnRaise will be the next best shaver to hit the market once potential buyers see that it’s available to purchase. This shaver comes with accessories, unlike its competitors.